Growth Habit: An erect thistle, growing to 150 cm high (but more commonly 60 to 120 cm) reproducing by seed. Some plants are single unbranched stems except near the top, others are branched and spreading from near the base. The stems are winged, which have spines, stout hairs and cobweb like hairs. The root is a branched tap root. The leaves are dark green, rough and hairy on the upper surface, lighter beneath because of a very dense covering of whitish hairs. Rosette leaves are lanceolate to ellipical, stalked and armed with spines on the margins and with wart-like protuberances on the upper surface. Stem leaves are up to 25 cm long, sessile with bases extending along the stems as wings, deeply divided into lobes, the tip of each lobe ending in a stout yellowish spine. Type of Plant: Annual or biennial herb. Flowers: Flowers are reddish to purple with the heads 3 to 5 cm in diameter, solitary or in groups of 2 or 3 at the ends of branches, surrounded by a large number of spiny bracts, about 100 florets per head. Fruit/Seed: Seed is grey or light brown with brown or black longitudinal markings, 3 to 5 mm long, 1.5 mm wide, smooth, somewhat flattened and sometimes slightly curved, with a pappus of soft feathery hairs 2 to 2.5 cm long. Dispersal: Spear thistle reproduces by a seed furnished with a pappus or ‘parachute’ of long hairs which is capable of carrying the seed over long distances. However, the pappus separates readily from the seed, most of which falls within a few feet of the plant, leaving the ‘thistle down’ to float away empty. Most seed is distributed by farm machinery and vehicles, internally and externally on livestock, by run-off after heavy rains and very frequently by feeding out contaminated baled hay. Distribution: Spear thistle is found in all settled parts of the State, but is more common in the lighter rainfall areas. Very heavy infestations occur in pastoral areas of the Midlands in some seasons, depending on rainfall distribution, grazing pressure and soil fertility status. Status: Spear thistle is a declared ‘Secondary Weed’ under the Noxious Weeds Act 1964. Landholders may be required to control spear thistle by an Enforcement Notice or to comply with prescribed measures contained in a regulation prepared under the Noxious Weeds Act. Heavy thistle infestations in pasture may virtually exclude grazing stock. Under such conditions pasture grasses may become rank, predisposing the area to damage by insect pests. Thistle spines in the fleece of sheep grazing infested areas cause difficulties at shearing. The large rosette suppresses pasture growth and competes for moisture and nutrients. Competition and Cropping. 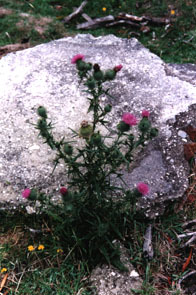 The best general control of spear thistles is obtained by encouraging competition from useful plants. Vigorous pasture helps to restrict seedling establishment and growth, and management practices should be aimed at maintaining a vigorous and unbroken stand during the period when thistles are germinating. Failure to control a heavy attack by pasture insects, which can lead to bare ground, may result in a serious invasion of spear thistles because of the lack of competition at a critical period. The sowing of useful species on patches of land left bare by insect attacks is recommended. Mechanical Control. Cutting or slashing when the plants are in the late bud or early flower stage, may help to reduce seed production. However, because spear thistles tend to mature over an extended period, this method of control is of dubious value. Moreover, in years when there is adequate soil moisture thistles are likely to recover and regrow. Hand hoeing is effective for individual plants and small patches provided the growing point and the top 20 to 40mm of the tap root are removed. Control by Grazing. Spear thistles are not normally grazed by cattle or sheep. However, block grazing, as opposed to set stocking, is likely to give some degree of control, particularly of seedlings. Goats will graze spear thistles at the flowering stage, eating flowers, seed heads and stems. Over a period of several seasons this prevention of seed production can produce a significant reduction in thistle numbers. For specific information regarding recommended herbicides consult the Department of Primary Industry and Fisheries for a copy of the Spear Thistle Service Sheet.